Discover what distinguishes Gerolsteiner Brunnen as an industry leader. Since 1888, Gerolsteiner Brunnen has set itself the singular task of supplying its customers with the best mineral water products in terms of both taste and quality. Embodied in our values and company culture are trust, respect for our regional roots, resource conservation and ecological responsibility. We respect the past, and embrace the future which is why innovation has always been a strategic priority – whether it concerns products, packaging or even internal processes. Gerolsteiner products are consistently aligned with consumer needs and the brand stands for a clear quality promise We honour this promise every single day in all areas. Whether in corporate processes, with a view to motivation and commitment, or when it comes to customer focus and our own innovative strength. Gerolsteiner Brunnen GmbH & Co. KG supplies the best-selling mineral water on the German market and is Germany’s biggest mineral water exporter. Gerolsteiner sells its products worldwide, including, but not limited to, Japan, USA and the Benelux countries. The brand is primarily known for Gerolsteiner Sparkling and Gerolsteiner Medium as well as for the still mineral water Gerolsteiner Naturell. In Germany, our product portfolio is rounded off with the St. Gero medicinal water and a range of naturally flavored mineral waters. In 2018, total net sales amounted to EUR 308.7 million. Sales amounted to 8.04 million hectoliters. Gerolsteiner operates twelve bottling facilities for glass and PET bottles (reusable and non-reusable). Our processing capacity varies depending on the type of bottle. For example, the capacity of our 1.0 l PET refillable bottle is 38,000 per hour and for our 0.7 l refillable glass bottle 57,000 per hour. With an average of 840 employees, Gerolsteiner is a major regional employer, a responsibility we do not take lightly, which is reflected by the loyalty of our staff. On average people work with us for at least 16 years; 196 employees have worked at Gerolsteiner for more than 25 years. We typically have about 54 apprentices on staff at any one time. Over internal 400 tests are conducted daily in our laboratories, adding up to over 146,000 analyses annually. In addition, regular external testing also takes place. Consumption of mineral and medicinal water in Germany is around 148 litres per capita per year. The Gerolsteiner visitor center has on average 17,500 guests annually. Gerolsteiner Mineral Water owes its special taste to the unique geological conditions of the spring’s location in the Volcanic Eifel. Carbonic acid of volcanic origin comes into contact with magnesium-rich dolomite bedrock, which is very specific to the Gerolstein region. As a result, a mineral water is created which is rich in minerals and tastes pleasantly neutral and refreshing in spite of its overall high mineral levels. Gerolsteiner mineral water is obtained from depths of up to 250 m from with the earth’s bedrock and it takes 50 to 100 years for nature to produce our superior mineral water. 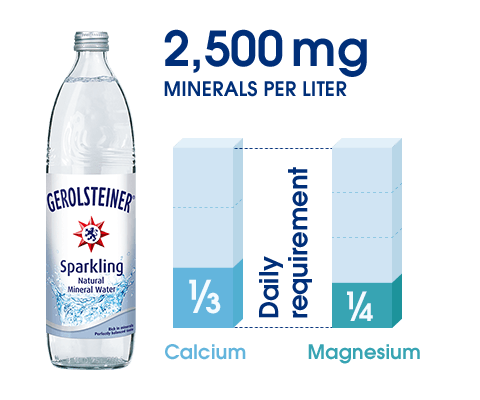 Gerolsteiner Sparkling and Medium (available in Germany) contain a minimum 2,500 mg of minerals per liter; this corresponds to 1/3 of the recommended daily calcium intake and ¼ of the recommended daily magnesium intake. We’re the highest-selling exporter of mineral water in Germany; worldwide exports account for around 5% of Gerolsteiner’s total sales. Consumers in over 35 countries enjoy our mineral water, primarily in the USA, Japan and the Benelux countries. How is Gerolsteiner mineral water actually made? And what’s so special about it? If you would like to see for yourself, we welcome you to visit us in Gerolstein. Tours of our visitor center are free. Here’s a route planner and our contact data so that your journey to Gerolstein is as pleasant as possible.